Prevailing over a wary opponent like this handsome male rainbow is largely dependent on perfect presentation of the fly. Learning to present the fly from a variety of angles makes a favorable outcome much more likely. “FISHING THE CLOCK” is a descriptive term for the ability to present the fly from any angle to a fish in moving water. Attaining this level of competence depends on mastering a variety of casting techniques that will allow you to effectively counter the host of obstacles that often present themselves. Of equal value is learning to determine the best position from which to present the fly and minimizing the length of the cast by wading strategically. When given a choice, I prefer to make my approach from the side and slightly downstream from a large surface feeder, and with the current moving from right to left. A positive curve cast will place the fly in the trout’s window of vision ahead of the leader while keeping the line well out of view. This method of presentation requires considerable practice and is usually limited to forty feet or less. In most instances, the positive curve cast is executed sidearm with a tight loop and extra line speed that overpowers the cast. An abrupt stop of the stroke applied at just the right instant will kick the fly and leader to the left in a pronounced curve. With the proper control, the amount of curve can be as long as the entire leader or as short as just the tippet. This control comes from the tip of the rod, which must be fairly stiff in order to develop the line speed needed to make a perfect presentation. An upstream wind can aid a positive curve cast, which can be delivered with less line speed but requires precise tip control for suitable accuracy. Too much flex in the tip will disrupt the aerial mend that allows the wind to induce a positive curve in the line. A negative curve cast (left to right) is executed by bringing the line under the rod tip and stopping the power before the line has straightened. Drop the tip to allow the line to settle on the water in a wide curve. A curve cast from a similar position but with the current moving from left to right requires a completely different maneuver if the angler is right-handed. Simply described, a negative curve cast is almost an underhand lob. With the rod held vertically, allow the backcast to dip slightly, and then sweep the line beneath the tip with an underpowered stroke that lifts the line upward and to the left, producing an upstream curve. Stop and drop the tip when the fly is in line but upstream of the target. This will kill the energy of the stroke and produce what is essentially an incomplete cast because the leader and part of the line are not allowed to straighten before the fly arrives on the water. Precise accuracy is not a general characteristic of the negative curve because it is often hampered by wind. However, with practice it becomes a useful tool for covering a sizable amount of water with a fly-first drift. When the trout’s location allows an approach from the side or somewhat upstream, a reach cast is a fairly easy way of obtaining a fly-first presentation. Begin this cast by starting the forward stroke toward the point on the water where you want the fly to arrive; then move the rod tip upstream. The fly will travel on its initial path while the line follows the rod tip upstream. Quick snap mends that add slack and length to the drift will enhance the effectiveness of this method of presentation. A reach cast to the right is used when the current is flowing from right to left; the left-hand reach is used when the situation is reversed. As in all casts, adjust your line speed to the wind force and the distance to the target. Perhaps the most favored presentation among anglers of limited casting skill is made from a position nearly directly upstream from the objective. And while it can be relatively effective, two negatives can come into play when the fly is presented from upstream. It is seldom that any trout will tolerate an angler’s presence within its window of vision, and it is never a good idea to allow the line to pass over the fish either in the air or on the water. 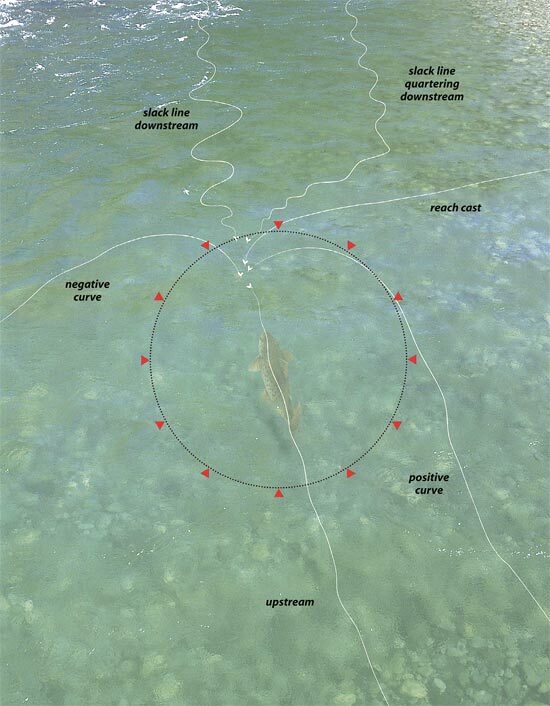 This is especially true in extremely shallow water or when the angle to the target is close to being directly downstream where the line cannot be led far enough away from the drift line to avoid alarming the trout. However, I concede that there are times when a directly downstream presentation is the only option, but I usually assume it will be a one-shot deal. 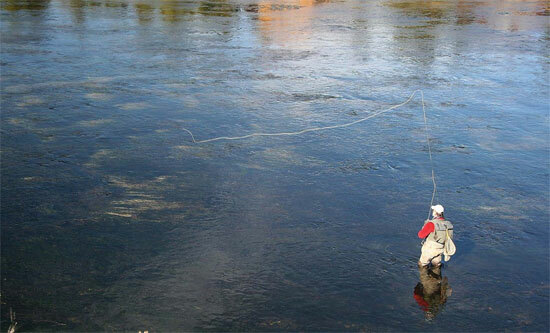 A slack-line cast made downstream allows the fly to reach the fish before the line and leader. Approaching the fish and making the cast without being detected can make this a difficult presentation to successfully execute. A careful approach is always a key element regardless of the angle from which the cast will be made. Clumsy wading practices inevitably spell defeat by sending trout warning sounds or water disturbance ahead of your advance. Each step must be taken with slow deliberation. Feel the bottom with each foot as you move forward, making certain of stability before placing your full weight on that foot. A successful stalk of fifty feet or less may take five minutes or more to complete, and it is here that many battles are lost without ever making a cast. A downstream presentation becomes much more logical in water at least thigh deep and should not exceed a 45-degree angle unless absolutely necessary. It pays to use any obstruction such as a dense weed bed or large rock that can shield your approach and shorten the casting range. Bending low over the water will lower your profile and allow a closer approach than were you to come in standing straight up. As a rule, you should expect the cast to be considerably longer when positioned anywhere upstream of your objective. I consider anything beyond forty feet to be a long cast when presenting the fly to a surface-feeding trout. And of course, the difficulty of proper execution increases in proportion to the length of the cast. However, a long downstream presentation can often be accomplished with a cast that is considerably shorter than the actual distance to the trout. 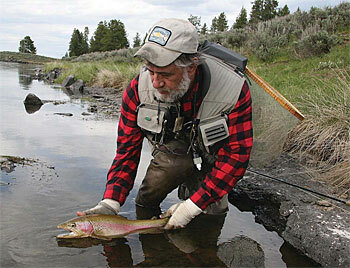 And this is undoubtedly what makes this approach so attractive to those of minimal experience with a fly rod. It is not uncommon to witness some success from anglers who get by with a rather weak delivery of the fly that arrives well upstream from the target but also beyond the correct line of drift. The fly must then be pulled into the desired position by dragging it across the surface. Assuming it is still floating, the fly is allowed to proceed downstream by dropping the rod tip and feeding slack into the drift with a series of mending actions. Hopefully the trout has not been put off by all the disturbance created directly upstream. Because all slack in the leader is removed prior to the beginning of the drift, this technique is not reliable when the fly must follow the subtleties of a complex current in order to arrive at the target in a natural manner. A much more precise and dependable way of delivering the fly from an upstream position is to use a strong casting stroke that generates more line speed than is needed to reach the target. Allow the full length of the line and leader to straighten well above the water, and then pull back sharply with the rod tip. This will cause the line to recoil back against the rod, and the leader will fall in loose curves to the surface. With some some time and a little effort spent in perfecting this technique, you will be able to efficiently place the fly where it needs to be and with enough slack to avoid drag. Using this method, it is possible to shorten the length of an otherwise long cast by depositing the fly on the water well upstream but in line with the feeding position of the fish. A series of crisp mends with the rod tip will allow extra line to be fed into the drift as described earlier. With the correct technique and the right rod action, it is not uncommon to maintain a fly-first dragfree drift for thirty feet or more. This is especially valuable in extremely shallow water where an approach to less than fifty or sixty feet will most certainly spook your objective. If the presentation is not accepted, always remember to allow the fly to drift well beyond the trout’s position before leading it away from the drift line with the rod tip. Strip the now submerged fly back upstream until you are certain that the motion of lifting the line for the next cast will not disturb the fish. It is my opinion that the shorter you cast, the better your success, and the one angle most likely to allow a close approach is from directly behind the fish. For many anglers, however, a straight-line cast made directly upstream is intimidating despite its fundamental simplicity. I think this is because this presentation is highly dependent upon accuracy and does not allow for manipulation of the fly’s position after the cast or mending to improve the drift. An upstream presentation is performed with the rod in a vertical position, and the stroke is made directly in line with the flow of the water. Aim the cast slightly to the side of the target, allowing only the leader to pass overhead. (The fish is less likely to touch the leader if the fly is an inch or two to the right or left.) Accuracy is more important than a long drift when fishing upstream. In slow water, a distance of two feet beyond the rise is usually sufficient to allow the fish to see the fly and intercept its drift. Faster water may require as much as double that distance. However, a fish that is holding close behind a surface obstruction such as an exposed weed bed may require that you put the fly literally on its nose. A tippet longer than thirty inches will hinder this kind of accuracy, especially when wind is a factor. 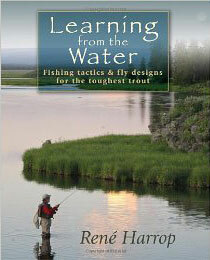 Allowing the leader and line to arrive on the water before the fly will induce premature drag. This can be avoided by stopping the rod during the delivery stroke at precisely the right instant to permit the entire leader to straighten just above the surface, thereby minimizing the effect that wind has on the placement of the fly. Drop the rod tip at this point to soften the impact. An upstream cast that angles across the directional flow of the current creates a significant increase in the difficulty of creating a natural presentation of a dry fly. A fly cast straight upstream will be carried in a line that does not conflict with the direction of the flow. Conversely, a cast made even slightly across the current will encounter quick drag as the flow pushes against the leader, causing the fly to move sideways rather than following the current directly downstream. A partial cure for this malady is to make a positive curve cast with a significant upstream mend. However, this technique can only be implemented from one side of the fish and is limited to a very short drift. A more versatile alternative is to use a check cast in conjunction with a longer tippet of forty to fifty inches. A tippet of inordinate length always carries the potential for diminished accuracy, but there are situations when this is the best way to go. A vertical casting stroke that keeps the line as parallel to the water as possible is best applied when making a check cast. Slightly overpower the delivery, and then stop the rod sharply as the leader straightens about four or five feet above the surface. The leader will spring back toward the rod tip and then pile in loose curves on the water with more slack than is usual. Pulling back with the rod tip will exaggerate the recoil, bringing even more slack into play if desired. The result will be a considerable delay in dragproducing tension on the leader as the fly drifts downstream. The check cast can be effective anytime a difficult current is working against you.